WARNING: This ADULT novella is mean and nasty and intended for a mature audience. It is absolutely not appropriate for younger readers. It is a gruesome, repugnant tale sure to warp young minds. Seriously. This is the second part in a two-part afterword for All Right Now: A Short Story, which I'm calling a foreword because I'm writing it at the same time I write the story. It's filled with spoilers and you should probably read the novella before reading this, and you should start with part one. It's now March 27th and I'm at 16,775 words. If I was going to write another zombie story, I of course wanted it to tie into the universe of my existing zombie novel (marketing 101), which meant I could revisit old friends and write my own fan fiction. This has proved a bit tricky. As All Right Now takes place during the same time as All Together Now, my current characters get entangled with past characters, some of whom I can't kill because I killed them in a specific way in the previous story, parts of which take place after the events of this story. The whole thing makes my head hurt and feels a bit like the third act of Back to the Future II. I'm also thrilled I got to give the reverend a speech about UFOs as the UFO speech in ATN got cut. I promise the previous speech made sense to the previous story, it was just placed in an unnecessary scene. But ATN was primarily about conformity and I believe the vehemence with which "practically minded" people deny the likelihood of flying saucers appearing in our skies despite the unbelievable mountain of evidence they're up there to be a prime example of social conformity. No one wants to appear stupid or to be a sucker and absolutely there is a lot of BS in ufology (the subject of another post I'll probably never get around to writing, but one should never believe everything one hears, particularly if it involves cattle mutilation for which there is a known, disgusting, natural explanation). However, it is the fallacy of composition to say that because some UFO stories are BS, all UFO stories are BS. It's easier to deny until official disclosure occurs and you deniers are not being looked at the way I imagine some readers to be looking at me in this moment. It's okay. My friend, Ashfall author Mike Mullin rolls his eyes at me when I mention flying saucers and he's really, really smart. But with such a disturbing amount of smoke in the form of astronauts, presidents, and top military generals going on record about UFOs, I'm betting there's some fire. Like the good reverend, for the purposes of this story I don't care if you're persuaded by UFO evidence or not. That's another type of book than the one I'm writing. Should I later appear as foolish for taking this subject seriously as Sir Author Conan Doyle appears for making inquiries into the existence of faeries, so be it (I'd love for someone to make any kind of comparison between us). Granted, I took some time off in the middle of this story to revise, polish, and publish Pizza Delivery. Still, ARN has taken almost as long as ATN to write despite being less than half the length. I'm typing this one-handed so my left hand can feed the baby. ARN is not just a story of my becoming a father, it's also the story through which I proved to myself I can still swing this writing thing while being a dad. I've talked at length about my inspiration for both ATN and ARN and my love of zombies. Still, I can't finish this foreword without discussing three authors whose brilliant work provided inspiration, all of them white and male, like me:) The first and most obvious inspiration is Robert Kirkman, whom I named the soda company for. The Walking Dead is awesome, yadda, yadda, yadda--I've said all that before and it's still true. The tone of both my zombie stories is a reflection of what I loved about Kirkman's graphic novels. In college after a break-up with a girl who broke my heart (there were a few), I read Ernest Hemingway's The Short Happy Life of Francis Macomber, which was the perfect time to read that misogynistic story. I don't remember the particulars of the relationship (all the girls who weren't Mrs. Ninja sort of blur together), but I remember that story and I reread it every so often. I find myself thinking of it at odd times. And the moment I realized my protagonist couldn't survive the zombie apocalypse no matter what he did as he was already dead in ATN, it was Hemingway's story I found myself thinking of. And why not? 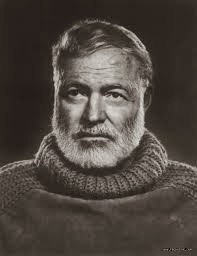 Without spoiling (much), Hemingway's protagonist is also a marked man, but before he goes he overcomes his fear and gets to experience the triumph of being a fully realized man, which is why his life is happy in addition to being short. At once, I realized my character's name must also be Macomber and I even found room for a Margot (though my Margot is kinder than Papa's version, which is why her last name is Wilson). Richard Macomber may not kill any lions or buffaloes, though there are gratuitous references to both as he kills zombies, making ARN my most pretentious story to date:) But Hemingway's proposition as interpreted by me is that all men die, not all men truly live. I say many men produce offspring, not all men become fathers. Fatherhood requires at least the same amount of courage as shooting an animal and more because you only have to shoot a thing once. Being a father is an every day and forever task. As a father, I'm disgusted by the number of depictions of fathers in popular culture as clueless oafs who only just barely avoid killing their children. Somehow, America has gone from celebrating Father Knows Best to Homer Simpson. But I say it takes courage and strength to be a father and it's a worthy occupation, even if we're all eventually dead. I think that's a theme that's a tad more encouraging than the theme of All Together Now and a nice note to end my time in the zombie apocalypse on. Never say never. I might just think up another zombie story some day. For now, I'm content to leave the walking dead behind me after just two tales in favor of more pleasant subject matters. But I had a lot of fun with these zombies and I hope you did as well, Esteemed Reader. I, too, am a big SK fan and though I m not a gamer, the Dead Island video is a piece of art in itself. I know that recent parenthood has driven you to explore the ZA trope and I am very much with you on the anti-father zeitgeist. Being a dad is this time of female empowerment requires fortitude. And I also realize that I risk sounding disrespectful by even writing that sentence, but that is not what I am implying. My wife is a magistrate and I know that when dysfunction calls it is no respecter of gender. And hey, I wear the badge with 3 grown up sons. They're all working in London but they still ring me up and ask advice--even when their mother is in the same room. It's what dads do and long may it last. I don't know what I'd do to help in the ZA. I guess, as a father, Cormac McCarthy said it all in the road anyway. So I've downloaded ARN and once my application for another two hours in the working day is approved, I will read it and come back. Thanks for sharing all this, and you are bloody clever to be able to type whilst feeding the baby. What you didn't say was whether or not you were using your feet! I'm here as DCF, my adult manifestation, but you were kind enough to read one of my MG books last year (The Obsidian Pebble) when I was being Rhys A Jones. It's always fortunate to have a writer such as yourself stop by the blog. Classes the place up:) Cormac McCarthy certainly said a lot. I hope you're not setting your expectations of ARN to that level:) I think it's quite possible to be pro-woman empowerment without being anti-man, but not everybody's on the same page. In any case, you're obviously a good father, I certainly try to be, and we're not the only two. The media will catch up, but in the meantime I'm writing pro-father books and so are plenty of others. Maybe you should give it a go (zombies optional, but highly recommended). Read and very much enjoyed for its heart as much as the style. Was that david Icke you were referencing? My review is on amazon and I made the mistake of beginning ATN. So you broke my heart. But I knew she was hiding a bite under that blue dress...look forward to your next adventure. The post post ZA?